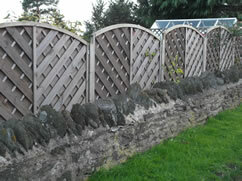 Fence panels come various styles and heights, they are usually 1800 - 1830mm (5' 11" - 6' 0") wide across all the ranges. The Lap Panel is the most popular because of its lower price to give an effective privacy fence. 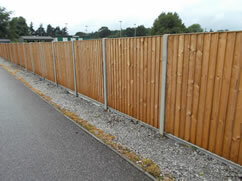 The Closeboard panel is a more robust fence panel that is in the middle of the price range. And The European style of panels which are more decorative. These panels are the premier panels available on the market and vary in styles and names according to marketing. The same style of panel may have different names depending on the company importing it. 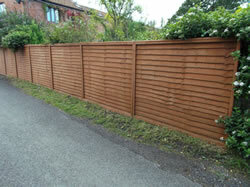 All these fence panels are able to be erected using wooden posts, usually 75mm x 75mm / 3" x 3" or 100mm x 100mm / 4" x 4". 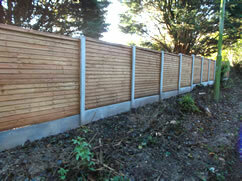 Alternatively, slotted concrete or 'H' posts can be used along with a concrete or wooden gravel board. West Country Fencing Supplies, Unit 6, Foxmoor Business Park, Wellington, TA21 9RF.